Once more, I've worn printed comfy pants to go for a walk, as they're really easy to wear and also really easy to match and mix. These pyjama-like pants were custom made by my friend Eme, and I'm pretty happy with them and also very happy everytime I visit her cute retail shop. I'm still not operative, so I'm taking it easy on commenting and blogging!. Wish you're having a nice summer! De nuevo, me he puesto pantalones cómodos con estampados para ir a dar una vuelta, ya que son de lo más fácil de llevar, y también muy fáciles de combinar y mezclar. Estos pantalones estilo pijama me los hizo mi amiga Eme y estoy encantada con ellos, y también cada vez que visito su tienda tan mona. Como todavía no estoy operativa, me tomo con calma todo lo que sea comentar y bloguear. Espero que estéis pasando un buen verano! Eme's done a wonderful job with those splendid trousers, they look wonderful in both outfits! You look gorgeous, my dear! 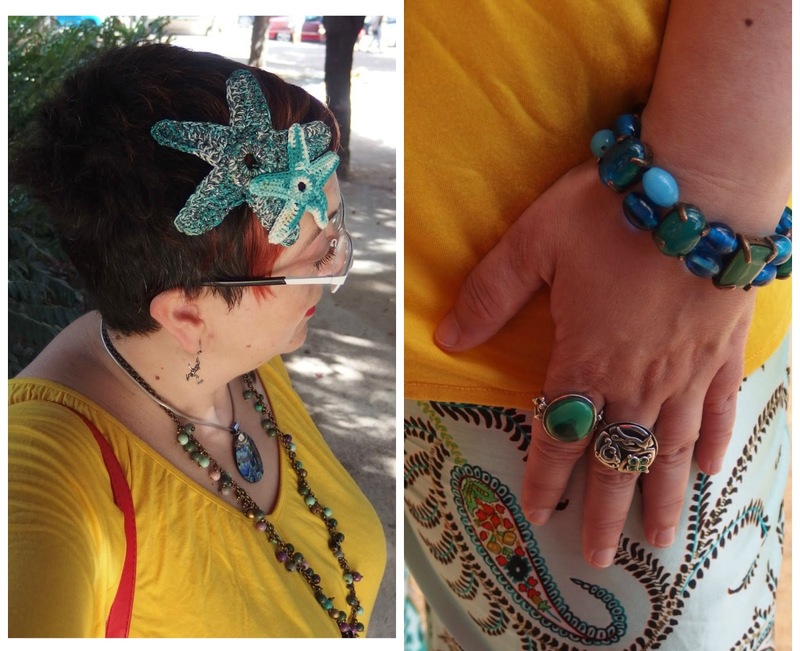 Love the bracelet, rings and your hairpiece. And the pants are fab! Ooooo I love them....the colour is divine, and that swirling pattern! That yellow is fab on you. So many lovely finishing touches that add a touch of glamour to those fabulous trousers. And then that yellow gives a sunny lift to everything.